Carpenter is in clear possession of a sharp-edged personality, so it was easy to pile on. When Tigers pitcher Armando Galarraga did something remarkably similar yesterday, however, it became clear that this type of behavior is not necessarily reserved for the people from whom we most expect it. After all, in watching his perfect game spoiled by a blown call, Galarraga showed more class and restraint than could reasonably be expected. So to see him flustered—completely undone over what was apparently some confusion with his catcher over pitch selection—served to illustrate what kind of line even the most collected pitchers walk under trying circumstances. At least Carpenter made an effort to carry on his conversation away from prying eyes (although he ultimately didn’t make it far enough into the dugout tunnel to succeed). 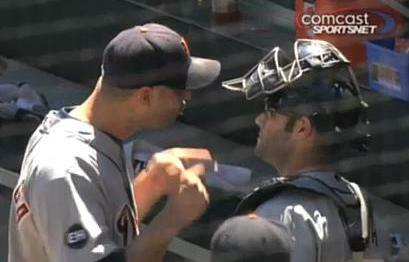 Galarraga’s dispute was totally undisguised. Avila, Galarraga and Laird all described it afterward as just a few heated moments, but only Laird cut to the crux of the matter when identifying what exactly prompted him to intercede in a fight that wasn’t initially his. “For [Galarraga] to come in and try to embarrass him in front of his teammates like that, I just didn’t think that was the right time to do it,” he told MLB.com. In that regard, Laird is spot on. Players have angry words with teammates all the time—behind closed clubhouse doors. Opening it up for public scrutiny goes directly against the Code, which has an entire section devoted to protecting secrets of the trade. In another odd twist, Fox Sports Detroit, which was televising the game in Michigan, opted not to air footage of the fight, nor did broadcasters Mario Impemba and Rod Allen ever mention it. One unwritten rule of the media involves editing essential pieces out of a story at risk of credibility. By failing to reference the day’s key storyline, FSD appears to care more about appeasing the home team than informing fans. FSD executive producer John Tuohey took responsibility, reported the Detroit News, saying that had the fight occurred during game action, rather than between innings during a commercial break, it would have made the air. It’s a weak argument. Comcast SportsNet Chicago aired the entire affair, and it didn’t seem a bit out of place. People understand that things happen while other things are on the air. That’s what replays are for. The Tigers won the game, so at least something went right for them.